The vlog channel of PointlessBlog’s Alfie Deyes. Who doesn’t love a good vlog… daily! Loving Louise’s new style of content, and of course the solid vlog here and there. Gotta love them vlog vids!! Phil does an impeccable jobs at making important topics engaging and interesting. Overall, his channel is very thought-provoking, which I value so much. Amy's channel covers everything from fashion to discussions about being a freelancer. A few weeks ago she spoke at a digital marketing conference in Boston, which was awesome apparently (I didn't get to go 😕). She is just a very cool and inspirational lady. 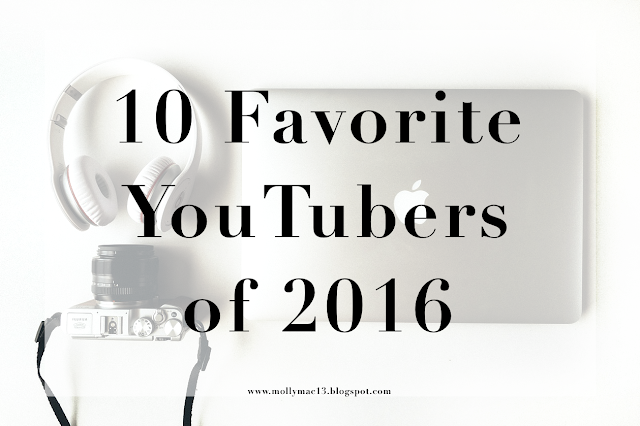 I’m just throwing myself onto this list because I can’t think of a 10th channel to include. I love that creating content for my channel has become a favorite thing of mine! I post about beauty, style, crafts, and lifestyle if you’re interested in following along! Who is your favorite YouTuber at the moment? I love this post! I will give the few I haven't seen a check out now! I follow almost half of the people you do. But I have an important question: Are you doing Blogmas od 12 Days of Christmas this year?